Samsung held a special Unpacked event ahead of the official start of MWC to showcase its latest flagship smartphones and the Gear 360 VR camera. In contrast to LG, with one press release detailing eight or more new products, Samsung has pushed out 12 press releases detailing just three new products; the Samsung Galaxy S7 and S7 Edge, and the Gear 360 camera. Despite all the marketing blurb I can summarise the improvements in the Galaxy S7 flagship pair in comparison to the previous iterations in very short order; redesigned smoother curves, an always on display, new processors, more RAM, improved cameras, larger batteries, water and dust resistance, a microSD slot, but noticeably thicker and heavier (especially the larger-screened S7 Edge). So let's work through these changes point by point which may help those who are looking to get a new flagship smartphone or even upgrade from a previous generation Galaxy S/Edge. Samsung says that it has "made a great deal of effort to add valuable functions and reintroduce consumers’ favourite features". 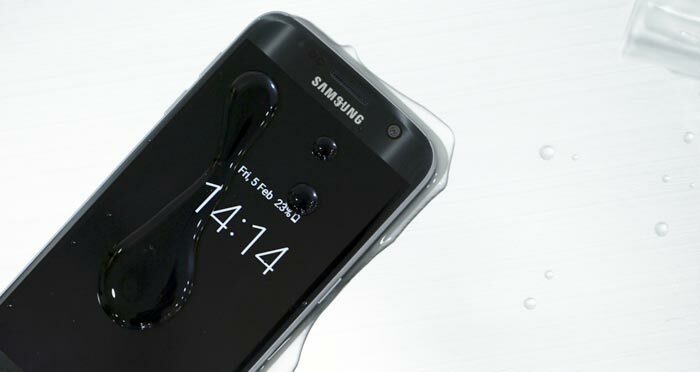 Starting with the design you can see from the pictures that the S7 models look familiar. However Samsung has "spent months perfecting" the curves on all four lengthways edges to provide a more comfortable and ergonomic pair of devices. 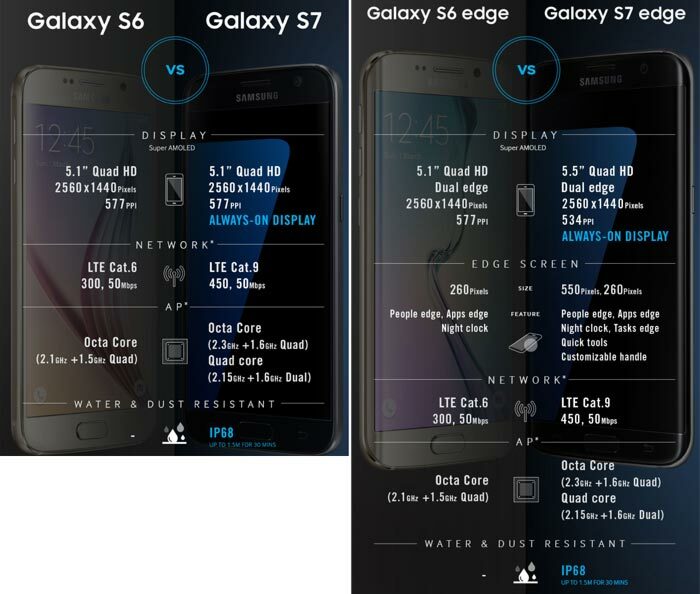 Both the S7 and S7 edge have thinner bezels and narrower bodies than their predecessors despite having larger screen sizes (5.1-inch and 5.5-inch, respectively). 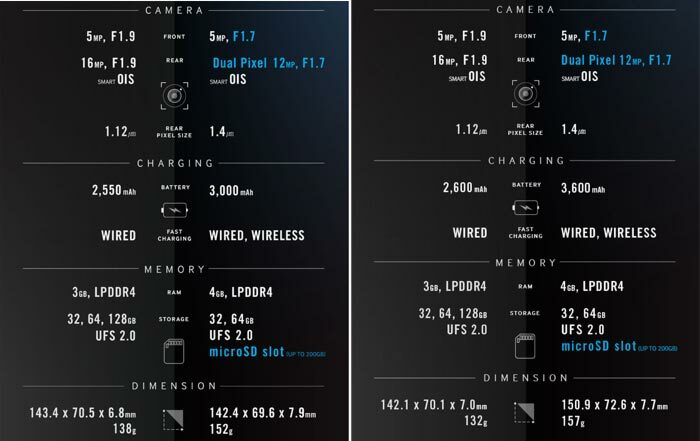 Looking at the specs we can also see that both phones are heavier and thicker though. The new cameras equipped in these smartphones are said to set "a new standard in mobile photography". Samsung's new models include dual-pixel sensors for faster focussing and these larger pixels 12MP main cameras collect more light. Compared to the Galaxy S6 the S7's sensor pixels are 56 per cent larger and you also get a lens with a wider f/1.7 aperture, providing 25 per cent more brightness. Thus you will see the greatest benefits of the new tech in that all-too-common scenario in the UK - a low light environment. As well as improved camera hardware Samsung has some new software facilitating 'motion panorama shots' and 'hyperlapse'. In other hardware updates Samsung has included faster processors, more RAM and expandable storage to the S7 and S7 Edge. Some of those improvements contribute to Samsung's "optimised for gaming" claims, as does the fact that these are "the first to use Vulkan API, which can significantly reduce CPU loads". While gaming your devices shouldn't get overheated thanks to Samsung's thermal spreader design. Like LG, Samsung has implemented an 'always on' screen. Users will constantly be able to see the time, date and personalised array of notifications on Samsung's AMOLED screen. All the screens are 2560 x 1440 pixels, just like the previous Galaxy S flagships. Both new models sport larger (non removable) batteries with the Galaxy S7 offering 3,000mAh and the Galaxy S7 edge has 3,600mAh. Samsung says that "each model now has enough power to let people watch an entire 13-episode season of their favourite TV show on a single charge". Faster wired and wireless charging have been implemented. Finally the new smartphones have an IP68 rating for dust and water resistance. 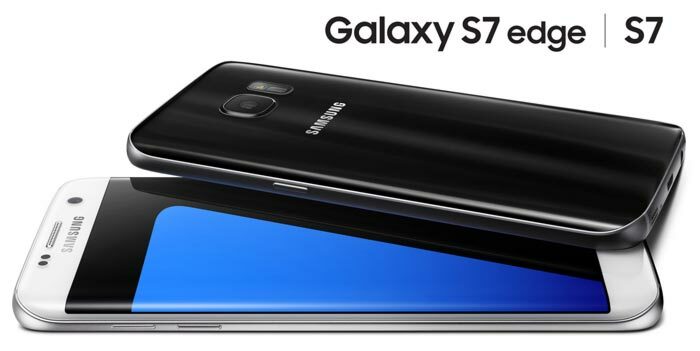 The Samsung Galaxy S7 and S7 Edge will be available from mid-March 2016. Currys emailed HEXUS to say it has these smartphones available for pre-order right now, starting from £569.99, SIM free. Apparently if you pre-order you can get your hands on one of these mobes three days before general release. 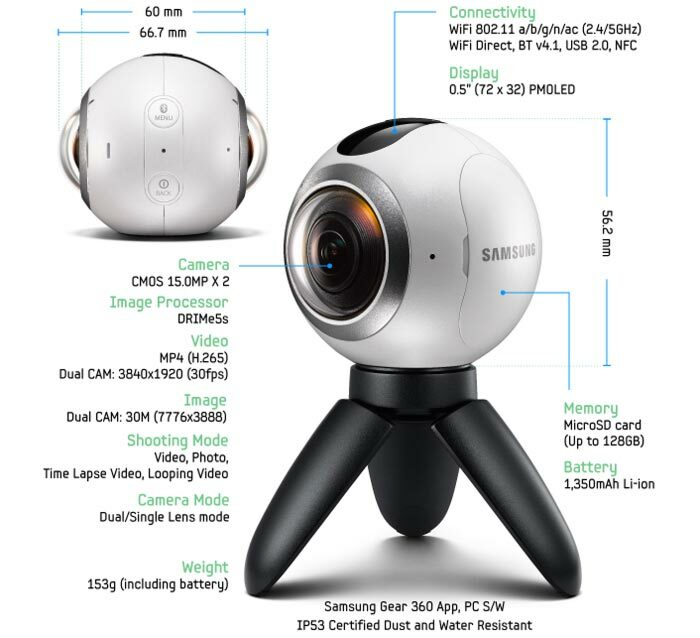 Samsung's Gear 360 lets users create, view and share their favourite experiences through video and still imagery. The hardware consists of a ball-like device which is equipped with dual 15MP fisheye cameras. These cameras use f/2.0 lenses and can shoot 3840×1920 pixel 360-degree videos and capture 30 megapixel still images. When used with a Samsung Galaxy S6, Note 5 or better smartphone users can preview content in real time when recording. A dedicated mobile app facilitates Gear 360 control and content sharing. The Gear 360 will be available from Q2 this year. Not sure i like the sound of always on screens, isnt that a battery killer? Its not like they are e-ink screens that use very little power to display a static image. They're AMOLED so if you're just displaying a small bit of text with the time then it hardly uses any. All the dark area uses nothing. It's basically what other phones including my OPX have had for a while - the option of displaying stuff on the lockscreen. It'll be purely optional of course. I have my current Nexus 5 and my (now boxed) One Plus X to sell….should hopefully get me around £250-275 when sold. If I can sell the Gear VR that comes with it for ~ £60 as brand new unboxed, should cost me around £240 to upgrade from my Nexus 5 all in. Tempting. Edit: Less than 70mm width….hallelujah! What to say that not said before… It's samsung they know what they doing and we love it :D Keep that way !